As the domain of civil society burgeoned in the 1990s and early 2000s—a crucial component of the global spread of democracy in the developing and postcommunist worlds—many transnational and domestic actors involved in building and supporting this expanding civil society assumed that the sector was naturally animated by organizations mobilizing for progressive causes. Some organizations focused on the needs of underrepresented groups, such as women’s empowerment, inclusion of minorities, and LGBT (lesbian, gay, bisexual, and transgender) rights; others addressed broader societal issues such as economic justice, social welfare, and antipoverty concerns. In many countries, the term “civil society” came to be associated with a relatively bounded set of organizations associated with a common agenda, one separate from or even actively opposed by conservative political forces. However, in the past ten years, this assumption and outlook are proving increasingly incorrect. In many countries in the developing and postcommunist worlds, as well as in long-established Western democracies, conservative forms of civic activism have been multiplying and gaining traction. In some cases, new conservative civic movements and groups are closely associated with illiberal political actors and appear to be an integral part of the well-chronicled global pushback against Western liberal democratic norms. In other cases, the political alliances and implications of conservative civil society are less clear. In almost all cases—other than perhaps that of the United States, where the rise of conservative activism has been the subject of considerable study—this rising world of conservative civil society has been little studied and often overlooked. This report seeks to correct this oversight and to probe more deeply into the rise of conservative civil society around the world. It does so under the rubric of Carnegie’s Civic Research Network project, an initiative that aims to explore new types of civic activism and examine the extent to which these activists and associations are redrawing the contours of global civil society. The emerging role and prominence of conservative activism is one such change to civil society that merits comparative examination. Taken as a whole, the report asks what conservative civic activism portends for global civil society. Its aim is not primarily to pass judgment on whether conservative civil society is a good or bad thing—although the contributing authors obviously have criticisms to make. Rather, it seeks mainly to understand more fully what this trend entails. Much has been written and said about anticapitalist, human rights, and global justice civil society campaigns and protests. Similar analytical depth is required in the study of conservative civil society. The report redresses the lack of analytical attention paid to the current rise of conservative civil society by offering examples of such movements and the issues that drive them. The authors examine the common traits that conservative groups share and the issues that divide them. They look at the kind of members that these groups attract and the tactics and tools they employ. And they ask how effective the emerging conservative civil society has been in reshaping the political agenda. 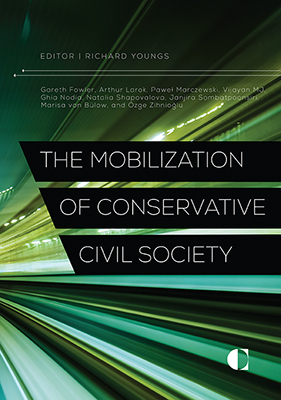 The volume works with a broad definition of conservative civil society. Part of its aim is to uncover exactly what ideas and political projects are included within the activities of civic groups that generally are referred to or define themselves as conservative. In this sense, the authors define conservative civil society as that which promotes any one or a combination of the following: conservative social values, religious values, strong national identities, exclusionary ethnic identities, traditional or customary identities and institutional forms, illiberal political ideology, or a curtailment of liberal personal rights. However, they do not assume that groups situating themselves under a collective banner of conservative civil society are all identical. Indeed, a core aim is to uncover the different varieties of conservative civil society that are ascendant across different countries and regions. Much commentary today refers to the rise of right-wing groups, nationalism, nativism, antimigration sentiment, populism, illiberalism, authoritarianism, and other terms that are all somewhat interchangeably associated with a conservative drift in popular values. The report’s working hypothesis is that more precise differentiation between and disaggregation of these different precepts is needed. Although conservative civil society does not necessarily involve antidemocratic agendas or violent tactics, some prominent groups do include one or both of these. Some previous attention has been given to what is sometimes termed “uncivil society,”1 referring to civic groups employing such violent and/or antidemocratic tactics. This report does not hold conservative civil society to be synonymous with such uncivil society. Some parts of it may indeed be uncivil in these terms; others parts will be peaceable and democratic, even as they remain critical of social liberalism. The authors are fully aware that moderate-mainstream conservative organizations and radical right-wing groups invariably reject being associated with each other; nonetheless, both are included in this volume because they represent different strands of a commonly ascendant conservative-rightist activism—the intention is not to portray them as political bedfellows. Stressing the need to disaggregate the different strands of conservative activism, the volume brings out the complex, varied relationships among them. Brazil, where conservative groups helped push then president Dilma Rousseff out of power in 2016 and now challenge core liberal democratic norms. India, where conservative civil society underpins Prime Minister Narendra Modi’s Hindu nationalist political project. Thailand, where new conservative social movements have helped sustain military rule. Ukraine, where Russian actions have ignited a wave of nationalist activism and European Union–linked liberal values have prompted social conservatives into action. Turkey, where Islamist civil society has become more influential and is effectively sponsored by the Justice and Development regime. Georgia, where conservatives increasingly have mobilized against what they see as a European liberal elite. Poland, where conservative activism now works closely with the Law and Justice government. Uganda, where different types of conservative civic groups have formed effective alliances against efforts to advance gender equality. The United States, where conservative civic activism has been influential since the 1980s and where its further rise has been both a cause and an effect of Donald Trump’s arrival at the White House. Extracting crosscutting points from these case studies, the volume’s main findings are as follows. Extent of support. In all the case studies, conservative civil society groups have been present for a long time, but have gained support and prominence in recent years. Yet even though they have become more influential and high-profile, in most instances they still cannot count on the same level of support as the best-known, well-established, liberal rights–oriented nongovernmental organizations. Some of the more extreme groups have gained notoriety beyond the scale of their numerical membership and level of popular support. The cases show that they can be effective in reorienting policy agendas even on the basis of relatively modest operations. Some conservative civil society groups have gained support as bottom-up organizations in opposition to embedded elites. Others have grown and expanded in a more top-down manner as favored partners to new conservative political regimes. Some conservative civil society organizations (CSOs) are closely allied to conservative political parties; others have set themselves directly against the type of conservatism present within their political party system. This means that even though many conservative CSOs are firmly autonomous from the political sphere, others act in ways that blur the line between civil and political society. It also means that whereas some parts of the conservative civic spectrum are crucial to understanding the rise of populist parties, other parts have little to do with the populist phenomenon. Combined identities and drivers. Today’s conservative movements share many aspects, but are far from uniform. Some define themselves in terms of an adherence to conservative social values. Some are principally organized to further nationalistic identities. Some profess to be radical, others more mainstream. Although some function as the civic base of the much-debated rise in global populism, others tilt against that growth. Across the report’s case studies, conservative civil society commonly involves a mixture of religious and nationalist values, along with an often-vague desire to hang onto or resurrect traditional identities. In some cases, however, religious conservatives, social conservatives, and nationalists are all at odds, rivals rather than partners within the civic sphere. Some of the resurgent nationalism is a relatively benign civic nationalism that reflects a search for belonging, community, and certainty; some of it shades into aggressive and intolerant assertiveness. Commentators and analysts today routinely write about the rise of conservatism in a way that holds this movement to be almost coterminous with a wide range of other phenomena—populism, nativism, nationalism, right-wing extremism, illiberalism, and authoritarianism. The case studies suggest that more care is required in distinguishing between these different trends. Although there are clear overlaps, these phenomena are not all the same thing. The studies show that several different strands of conservative civil society are on the rise and it is unduly simplistic to reduce these to a single, uniform trend. The ubiquitous press coverage generally approaches the topic through the lens of anti-immigrant positions and populism, but the growth of conservative civil society is far broader and more varied than this implies. The case studies reveal that the economic and libertarian strands of conservatism are far less preeminent in the recent rise of conservative civil society; rather the religious-nationalism mix appears to be predominant. If anything, on economic issues the divide between leftist and rightist civil society organizations seems to have narrowed, to the extent that the conservative camp has come to question some of the precepts of free-market globalism. This perspective helps to explain the apparent paradox that economic crisis has fueled conservative activism just as much as leftist movements. For most of the groups examined here, conservative activism is the search for protection—protection from change, from outside economic pressures, from new kinds of identities and moral codes. Curiously, these groups generally want a stronger state and more robust government intervention to provide this protection. With the partial exception of the United States, the strand of conservatism that focuses on freedom from the state is less apparent in the countries included in this volume. Some such groups are present, but they are not the leading edge of today’s conservative civil society. Democratic and antidemocratic. One key distinction that must be made is between those conservative groups that support democratic norms and those whose beliefs rub uneasily against such values. The rise of conservative civil society poses serious challenges to liberal democracy. At the same time, it is important not to label all conservative groups with the same authoritarian label. Conservative civil society is not synonymous with authoritarianism. In Thailand, much of it clearly is indulgent of authoritarian rule; in India and Turkey, it is illiberal in many senses but is less overtly nondemocratic. In Brazil and Ukraine, some conservative activism is animated by a desire to deepen and protect democracy, while other conservatives question the adequacy of democratic norms. In Poland, conservative activism is closely aligned to a project of political illiberalism; in Georgia, this is much less the case. In short, in some countries, conservative activism is part of the current threat to democracy, but at the same time this activism is neither necessary to nor sufficient for explanations of democratic regression. Disentangling its relationship with liberal political norms is no easy matter. Today’s conservative civil society is sometimes associated with unchained majoritarianism, but sometimes bases its whole rationale on resisting the majority will. Taken as a whole, the emergent conservative activism in this sense harbors a paradox: it presents itself as a minority strand that has been unfairly sidelined by liberal majority opinion, yet it also often claims to speak in the name of a silent conservative majority against minority rights. Indeed, whether democratic or undemocratic, this is where conservative activism appears to suffer a core inconsistency in its varied guises across different national contexts. It commonly sets itself against liberalism for creating an unaccommodating hegemony, and yet it tends to admonish norms that hold in check its own hegemony over others. It complains that others are intolerant of its values, while calling for less tolerance of others’ moral and political codes. Tactics. The case studies show that some parts of conservative civil society are willing to use violent tactics and others categorically reject such extremism in favor of milder and more practical approaches to civic activism. The ascendance of conservative groups is often held to be inseparable from the rise of digital technology and misinformation. Some such groups undoubtedly have become expert in digital activism and have ridden the current wave of fake news and propaganda. Others, however, have developed through more traditional kinds of protest tactics or established themselves to play more functional roles within local communities. In this, they mirror other parts of civil society and the range of tools that activists now deploy. Some are happy to partner with other ideological strands of civic activism, while others are unapologetically uncooperative and uncollegial. Extreme versus moderate. Flowing from these considerations is the thorny question of whether it is apt to describe conservative civil society movements as “radical.” Current commentary often tends to assume that the rise of conservative civil society denotes, or goes hand in hand with, a radicalization of political views and actions. The case studies show that a common strain of extreme conservatism is indeed gaining ground across different countries and regions. It is extreme in the sense of its questioning of basic liberal norms, in the absolutist manner in which it espouses its core beliefs, and in the uncompromising and intolerant nature of the tactics it deploys. Other parts of the conservative spectrum do not fit this description quite so readily. Many civic groups may adhere to a very conservative form of conservatism but follow the democratic norms and campaign tactics of mainstream civil society. One may disagree with such high conservatism, but it is difficult to see how it qualifies as radical or extreme any more than extremely robust and principled forms of liberalism do. The common tendency to describe the rise of conservative civil society as radical and extreme needs to be more carefully and discerningly applied. International implications. Finally, it is clear that more analysis is needed to fully understand the implications of the rise in conservative activism for the international community and those organizations involved in supporting civil society. The short case studies in this volume do not cover this issue in detail, yet they signal how many conservative movements define themselves expressly as a counterpoint to internationally supported civil society. Notably, many conservative organizations insist they have deeper and more authentic societal roots than what they portray as a liberal civil society created mainly at the behest of international donors. In this sense, conservative civil society is one expression among several of local civic groups’ growing concern about being too closely associated with external actors. This is a global trend that is likely to deepen rather than abate. The international community will need to strike a careful balance in response to this mindset. Although donors will need to broaden the range of groups they fund, they also will have to adjust to situations where parts of civil society will eschew the kinds of international partnerships that rights-based organizations have relied on. International civil support cannot ignore the rise of conservative activism or favor only those groups hostile to this trend. All the same, it will need to be more robust and pointed in defense of core liberal-democratic norms, as these are challenged not only by governments and high-profile leaders but also by parts of civil society itself. The Carnegie Endowment’s Democracy, Conflict, and Governance Program thanks the Charles Stewart Mott Foundation, the Ford Foundation, the UK Department for International Development, and the Australian Government Department of Foreign Affairs and Trade for research support that makes possible the work of the Civic Research Network. The views expressed in this report are the responsibility of the authors alone. 1 Petr Kopecky and Cas Mudde, Uncivil Society? Contentious Politics in Post-Communist Europe (London: Routledge, 2003).